So you’re ready to learn more about getting started with Essential Oils? That’s great! I really think that you won’t regret this decision. 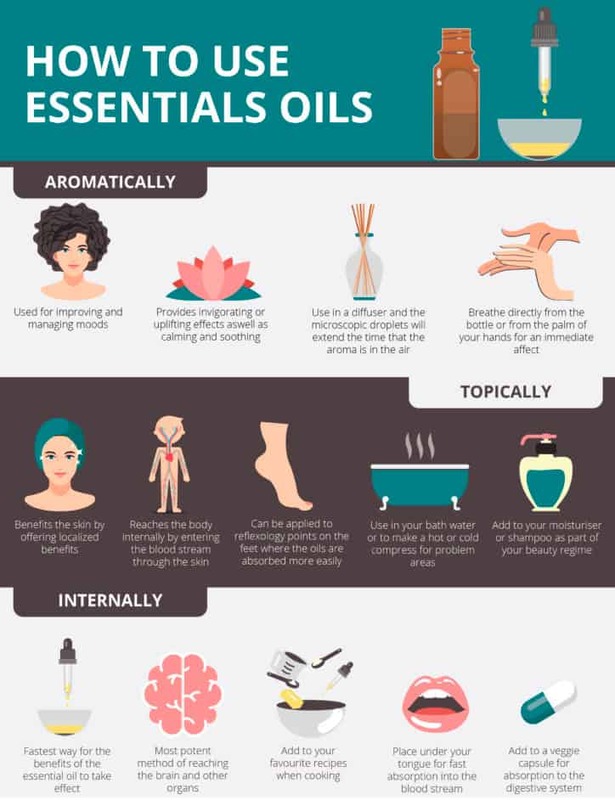 I’m excited to share with you the basics about essential oils so that you can better understand what they are useful for and what ways you can incorporate them into your daily life. We’ll talk about what essential oils are, how they are made, how they can benefit your life, the practical ways you can use them, and the safety concerns as well. Surprisingly, essential oils do not actually qualify as ‘oils’ at all! When it comes to scientific terms, the essential oil is a concentrated ‘hydrophobic liquid’ that contains aroma compounds from the plants that are volatile (meaning they have a tendency to vaporize when exposed to air). Essential oils are so highly concentrated that it can take pounds and pounds of a plant to make essential oils. In fact, it takes approximately 1500 lemons to make one pound of lemon essential oils. Or 250 pounds of lavender plants to make one pound of essential oil. That’s a great many plants crammed into one little bottle! Not only does this liquid contain the very strong scent of the plant it came from (just open up a bottle and take a whiff—you’ll see!) but the oils also contain the therapeutic benefits and properties that are purely and completely natural. These are useful for so many varied purposes. The fact that it takes so many plants to make just a little bit of oil the reason that essential oils can seem very expensive. The good news is that essential oils are so power-packed that it only takes a drop or two to be effective. And as long as you store them properly, essential oils have a very long shelf life so you can use them for 1-6 years, or even longer depending on the specific oil. Citrus oils seem to have the shortest shelf life, but also tend to be less expensive, so it evens out. Essential oils are extracted from a myriad of different plants using a couple of different methods. In order to remain 100% pure and qualify as “essential oils”, it is critical that these substances be extracted without the use of any harsh chemicals that could taint their purity. The way essential oils are made and the processes used can make or break their quality. There are two main ways that pure, therapeutic essential oils are extracted and the process mostly depends upon the particular plant. This process for extracting the ‘essence’ of the plant has been used for hundreds of years and is still the most common today. In this case, steam is used to rupture the membranes of the plant parts (leaves, stems, roots, petals, bark, etc.) so that the essential oil is released in a liquid form. 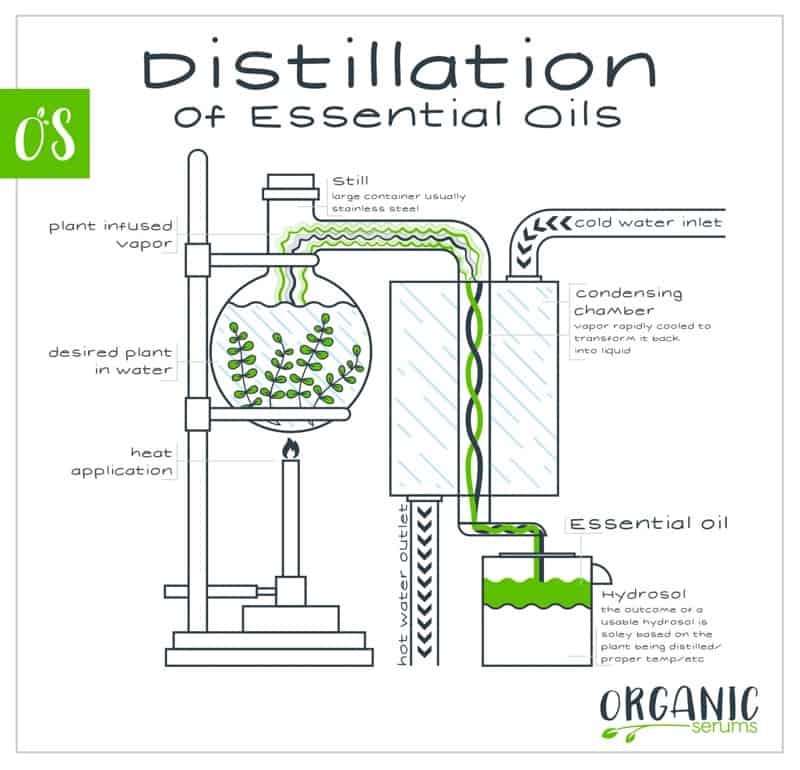 For certain plants, namely citrus fruits, the steam distillation processes do not work to produce essential oils. Instead, for citrus fruits such as orange, grapefruit, lemon, and lime, the peels of the fruit are pressed without any solvents or added heat of any kind. The result is a pure, fresh, fragrant oil. Another extraction method for oil that cannot be produced through steam or cold pressing is typically used for fragrance oils. Rose, for instance, cannot be extracted into a pure essential oil but is often beloved when added to perfumes and fragrances. Oils that require the use of extraction chemicals, such as alcohol, are not technically essential oils and are called “absolute” oils. They may still be useful for certain reasons, but are not completely pure, which means that they have limited uses and should never be ingested! Healing, health, and wholeness are all aspects of our lives that we aim to achieve each day! Aromatherapy is a word you may have heard. It’s a big word that basically boils down to using essential oils to bring people into a better and healthier relationship with our bodies, our minds, and even our feelings. Providing healing, protecting from illness and injury, promoting a stronger brain, and balancing our emotions so that our bodies and brains function just a bit more like they are supposed to. Essential oils offer almost more properties and benefits that can be named in one sitting, but I’ll try to give you a good idea of the kinds of ways oils can be used to help you in various parts of your life. Remember, each oil has a variety of powerful benefits and they often overlap from oil to oil. Seriously, huge books have been written about the details of each specific oil and how they can be used in a myriad of ways to benefit your life. And, although I don’t have personal experience with every one of them, I have experienced enough to know that essential oils have changed my life—and they can change yours too. Essential oils can be used in several different ways, whether simply through breathing in the scent, applying them topically to the body, or ingesting them. 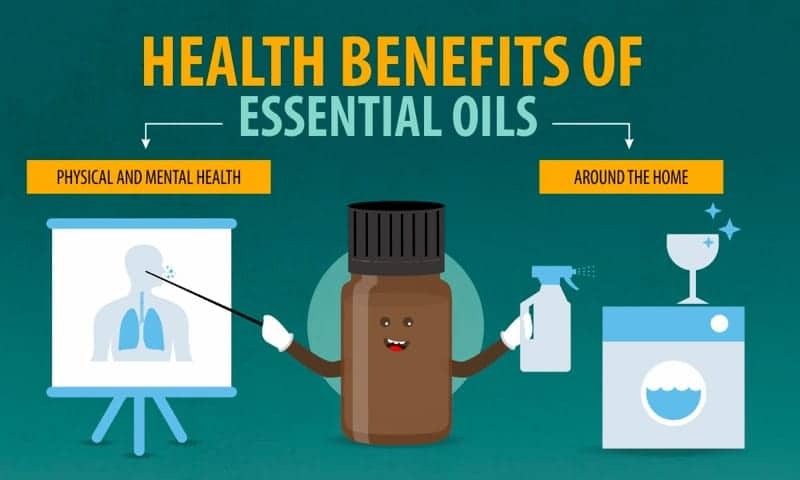 Here are the most basic ways that people use essential oils in their everyday lives. From a physical health standpoint, essential oils work their ‘magic’ on your body by getting into your blood stream. The simplest way for this to happen is literally to open the bottle and take a sniff. Within just a few seconds, many of the powerful chemical compounds have already reached your brain. Wow! That’s fast. But if you’re like me, you don’t want to be stopping to take a whiff from a bottle periodically throughout your day. Plus, if you want your essential oils to have therapeutic benefits for your family, you’ll need a better way to get the people around you smelling the oils. That’s where an essential oil diffuser comes in. This, in my experience as well as in the opinions of many experts, is the best way to diffuse essential oils into the air in your home. These machines have water reservoir and are typically electric or battery powered. Diffusers either nebulize or use ultrasonic waves to create a fine mist out of water in which the essential oils are placed. This cool mist is then released into the air and then breathed in by anyone who happens to be in the vicinity. It is important that essential oils are used with cool mist humidifiers, rather than steam, because the therapeutic effects of the oils could be compromised when exposed to heat. Although some people use essential oils in a burner, sort of like a candle, I find that to be an ineffective use of my oils since the therapeutic benefits are compromised because of the heat. Ultrasonic and nebulizing diffusers come in all shapes and sizes. They may range in effectiveness from a small office to a larger room, and they may last for just a couple of hours at a time or throughout the night. Many people like these types of diffusers because they cool mist works to humidify the air while simultaneously carrying purifying essential oils throughout your home, office, or classroom. Another type of diffuser that some people like is ceramic and works in a similar way to the popular fragrance reed diffusers. This type of diffuser is made from unglazed, ceramic clay. It is often made to look decorative and the essential oils that are dropped on it will simply float into the air. Some people like this type of diffuser because it doesn’t require any electricity or heat of any kind. For a personal touch, some diffusers are made into jewelry! The charm is usually in the form of a locket that opens up to reveal a small cotton pad on the inside. A few drops of essential oil can be placed on the pad. When it’s worn around the neck, it helps you carry your favorite essential oil around with you wherever you go! I like to wear mine particularly during winter months when cold and flu germs are at their height. For people who have long commutes in their car or want to take their essential oils wherever they go, some options are available for diffusers that work in your car. These can be installed into the vents, similar to a car air freshener. Place a few drops of lavender in your car diffuser to keep the kids calm on a long road trip. Or add a few drops of peppermint or rosemary essential oil so that your morning commute gets your day going with energy and focus. Applying essential oils directly to the skin in a quick and effective way to get them into your bloodstream and keep them there for some time. It is important to remember that essential oils are extremely powerful substances that, for the most part, need to be diluted before you use them. When applying essential oils topically, they can be diluted with what is usually referred to as a carrier oil. This can be any type of mild, unscented oil that you can safely apply to your body. I like to use grapeseed or apricot kernel oil as they are affordable and helpful to the skin. Some people spend a bit more on their carrier oil for something like avocado oil. Other people are happy to just grab the canola or vegetable oil from their kitchen cabinet and call that good enough! It’s really up to you. When applying essential oils topically to your body, the place you apply it will depend on what you are trying to use it for. If you want all-over effects, truly the best place to put your oils is on the bottoms of your feet. The pores in your feet are more open to absorption than anywhere else on your body. So during the winter when I’m using an oil blend to boost my immune system, it goes onto the bottoms of my feet (diluted with a carrier oil, of course) and then I put socks on. If you’re applying your essential oils topically to reduce pain related to something such as arthritis or an injury, it makes sense to apply them directly to the area that is bothering you. And, if you are using your oils to help heal a wound or a pimple, then a dab directly onto that spot should do the trick. Caution: certain essential oils that are safe to use on your body at home may have an adverse reaction if your skin is exposed to the sun. This may be especially true for citrus based oils such as lemon or grapefruit. Also, some oils can cause allergic reactions or sensitization of certain people. Be sure to perform an allergy patch test before applying a new essential oil to a large area of the skin. When talking about using essential oils internally, we’re getting into some sticky territory. Unless you are deeply certain of the purity of the essential oils you are using, it can be very risky to ingest them into your body. If your oils are not 100% pure and have been extracted using any chemicals, they should never be ingested. Additionally, it’s important to remember that some essential oils are made from plants that are actually dangerous for human consumption and should never be ingested! Wintergreen, cedar leaf (Thuja) and mustard are some essential oils that could be poisonous if ingested into the body. With that in mind, it is critically important to keep your essential oils stored in a place where your children (and pets) will not have access to them. That said, many people find that essential oils made from various plants that a person might eat anyway are safe for consumption as long as it is in a very, very limited amount. For instance, many people find that peppermint oil is an effective helper for stomach issues if just one drop is ingested. Certain essential oils may also be used in the kitchen for baking, cooking and as a food additive. It is important to note that extreme heat will compromise the naturopathic benefits and make them ineffective for medicinal purposes. All the same, essential oils such as lavender, citrus, ginger, thyme, and other essential oils can be used in the kitchen. Do remember that just a little bit goes a very long way so limit your usage until you’ve tested its strength. Using essential oils can be extremely safe and shouldn’t cause you worry! But just like anything you might have in your medicine cabinet, you should treat it with respect. Of course, just like with any powerful substances used for your health, you should talk to your doctor before using essential oils—particularly if you are already taking prescription medication. This is important to make sure that you won’t suffer from any adverse reactions. Some essential oils can affect your blood pressure, digestive system, hormones, and even the way your body responds to medication. Even though they are natural, they should be treated seriously as a homeopathic therapy in the same way you would talk to your doctor about which vitamins or other supplements you are taking. This is especially true if you are pregnant, have epilepsy, or other health conditions. An important piece of information for essential oils is understand how to store them. Because essential oils are particularly volatile and delicate, they are susceptible to reduction in efficiency (and even possibly becoming toxic) when exposed to extreme temperature changes, light, or even too much time in the open air. Essential oils should always be stored in glass bottles, as the chemicals in plastic will leech into the oils and contaminate them. Essential oils should be kept away from light because their powerful compounds can break down when exposed to light. This is why most essential oils companies sell their products in brown glass or dark blue glass bottles. In addition, don’t keep them on a window sill or place where they are exposed to direct sunlight. For the same reason, essential oils should be stored at room temperature. Don’t leave them in a hot or cold car, store them on the window sill, or even put them in your checked baggage in the hold of an airplane. If you do this, their therapeutic benefits could be significantly reduced. Of course, keep all essential oils out of reach of children. Because there is so much power in just a few drops, it could be extremely harmful if a child were to ingest even just a small amount. The essential oil may be flammable and should be stored away from any fire hazards. Thank for joining me on this journey of using essential oils in your life. I hope you’ll find this information helpful as you explore the ways that essential oil might benefit you as well as your home and your family. It’s a pleasure to be on this natural path with you!